Italy is on the brink of installing the most unconventional, inexperienced government to rule a western European democracy since the EU’s founding Treaty of Rome in 1957. It would consist of the anti-establishment Five Star Movement and the far-right, anti-immigrant League. These parties regard Italy’s modern political system as a rotten failure and the EU’s governance and policies as riddled with flaws. Before Italy’s March 4 parliamentary elections, the received wisdom in other EU capitals and financial markets was that a Five Star-League government would be the most disturbing of all possible outcomes. Now the barbarians are not merely massing at the gates of Rome. They are inside the city walls. Yet Rome in 2018 is not Rome in 410, and neither Five Star’s Luigi Di Maio nor the League’s Matteo Salvini is King Alaric of the Visigoths. The two parties enjoy unquestionable democratic legitimacy, having won the elections. It is right that they should have an opportunity to govern Italy. Excluding election winners from power is not a step worthy of a mature democracy, if — as is the case in Italy — the victors have achieved their success fair and square. 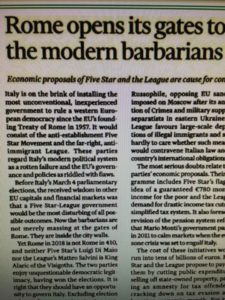 Mainstream Italian parties have only themselves to blame for the fact that Five Star and the League occupy the commanding political heights. For at least 20 years, Italy’s national story has been a one of economic stagnation, halfhearted reforms and at times woeful misgovernment. Should Five Star and the League come to power, they must show they can govern Italy more responsibly than their opponents give them credit for. If they fail, voters will have the chance to punish them in future elections. All this said, the policies in their so-called “contract for the government of change” give many reasons for concern. The two parties are excessively Russophile, opposing EU sanctions imposed on Moscow after its annexation of Crimea and military support of separatists in eastern Ukraine. The League favours large-scale deportations of illegal immigrants and seems hardly to care whether such measures would contravene Italian law and the country’s international obligations. The most serious doubts relate to the parties’ economic proposals. Their programme includes Five Star’s flagship idea of a guaranteed €780 monthly income for the poor and the League’s demand for drastic income tax cuts in a simplified tax system. It also foresees a revision of the pension system reform that Mario Monti’s government passed in 2011 to calm markets when the eurozone crisis was set to engulf Italy. The cost of these initiatives would run into tens of billions of euros. Five Star and the League propose to pay for them by cutting public expenditure, selling off state-owned property, passing an amnesty for tax offenders, cracking down on tax evasion and boosting economic growth. For two parties that purport to represent something new, it is striking how stale most of these ideas are. Previous Italian governments, especially those led by Silvio Berlusconi, tried them. They were never more than partially effective. As a result, a Five Star-League government might find itself at odds with the fiscal orthodoxies of other EU governments and the European Commission. The EU would be justified in standing its ground. Still, it should recognise that Italy’s chief problem over the past two decades has not been budget deficits but a lack of economic growth and insufficient institutional reform. These are areas where the EU can and should work constructively with Italy’s next government — even if it means humouring the iconoclastic rhetoric of Five Star and the League.